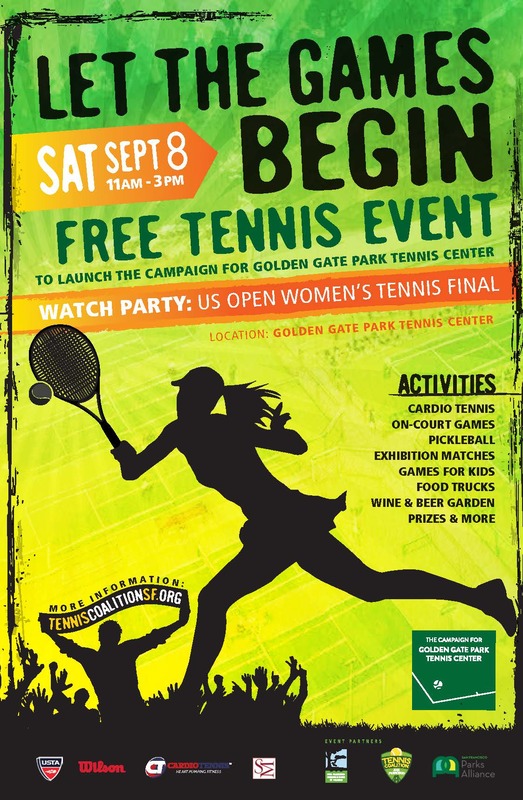 We had so much fun on September 8th at the Party for Golden Gate Park Tennis Center! Nearly 500 people came to the park on this gorgeous San Francisco day to have fun on and off the court and to support the fundraising campaign to renovate GGPTC. Adults and children alike took part, playing games and doing drills, clocking the speed of their serves, getting a workout with Cardio Tennis, watching exhibition matches with USF players, talented junior players and advanced adults, and witnessing pickleball in action (some for the first time!). The day culminated in a watch party for the US Open Women’s Final, a match that will certainly be remembered for years to come! We’d like to thank our wonderful sponsors -- Wilson, Sean Minor Wine, Fort Point Beer, Cardio Tennis, Hint Water and USTA NorCal -- for their generous support. And of course we want to thank everyone who came out to support the Campaign for Golden Gate Park Tennis Center! Parking will be limited. Please consider public transit, ride sharing or carpooling. Join us as we kick off the "final set" of fundraising to renovate Golden Gate Park Tennis Center. Event proceeds benefit the Campaign for Golden Gate Park Tennis Center. Every dollar raised – up to $6.5 million – will be matched by Taube Philanthropies. Cheer on your favorite player: Watch the finals on a huge HD screen with hundreds of fellow tennis fans. Enjoy delicious beer and wine after sweating it out on the courts. Test your skill on court with fun games that will get you moving, laughing and making new friends! Or sit back and watch an exhibition match or a pickleball demonstration. Try out the latest craze in tennis! Cardio Tennis will get your heart pumping with group tennis drills, games and skills! Be sure to register and choose a time slot that works best for you. Join in the fun! Leave with amazing prizes, be at the top of the leaderboard or try your luck to beat the pro! Coaches will be on the courts leading fun games and drills for children of all ages and abilities.